One strobe used from the side and strong sunlight from the other direction. Cloned out some miner distracting elements as a a thich wire sticking up from behind his leg and some other smallstuff. Lovely shot Arnthor, congrats on your top ten finish! Congratulations on your top 10 finish Arnþór. Great shot! Congrats on your top ten placement - this is such a cool shot!! Congrats on your top 10 finish Arnþór! very good shot! Your images deliver a good visual splash. Congratulations on your top 10 finish. Great image!! very sharp and beautiful background. Like this one. Colors sharpness the background ! Love the photo - Nice background and a convincing woody! This appears to be very nicely blanced and light. Only something is missing for me to give it the full wow factor. Excellent photo! Superb lighting and setup. Your pp looks prestine, but the whole image doesn't work much for me. 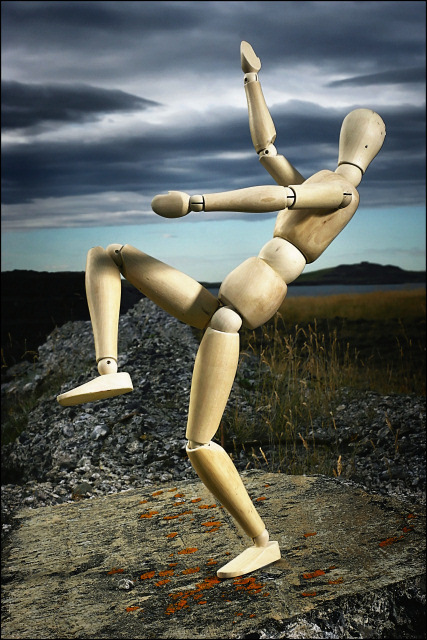 You've got a surreal landscape background which is not consistent to the "dancing Woody" (or at least does not evoke it). Dance, Woody, dance! Nice pose, nice shot. Great position for the title. Very nice! Love the post process! I really like the background you have in this. Great lighting, good foreboding background. ...and a bad spellr! :) This is a great setup! Well done. Proudly hosted by Sargasso Networks. Current Server Time: 04/19/2019 04:15:48 PM EDT.